Two weeks ago was the start of my stay-cation. Hubby and I didn’t go away this year for a variety of reasons, and he decided not take the week off, but rather continue spending the time looking for a new job. I, on the other, had grand plans of running in the morning, eating lunch with Hubby in the early afternoon, and reading by the pool for the rest of the afternoon. Before my week at the pool began, though, Hubby and I kicked off my stay-cation with an evening of good food and our Sunday True Blood. 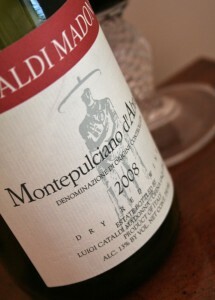 The 2008 Cataldi Madonna Montepulciano d’Abruzzo had a deep ruby color with a purplish tint. On the nose, there were cherries, blackberries, plums, blueberries spices, and violets, followed by a hint of rubbing alcohol. In the mouth, there were juicy dark plums, ripe blackberries, blueberries, and a hint of violets. The wine had light-to-medium tannins, a medium body, and smooth acidity. Is this worth a glass after work? It’s worth more than one! What are you waiting for? At $27, this wine is well balanced, intense, and luscious. It needs to breathe a little before it shows it’s true flavors, but it’s well worth the wait. The wine paired nicely with the prosciutto that Hubby and I snacked on early in the evening, as well as with the steaks with truffle butter that he made for dinner. The wine was also a perfect, supple choice to sink my teeth into as we watched the intense second-to-last episode of this season’s True Blood.